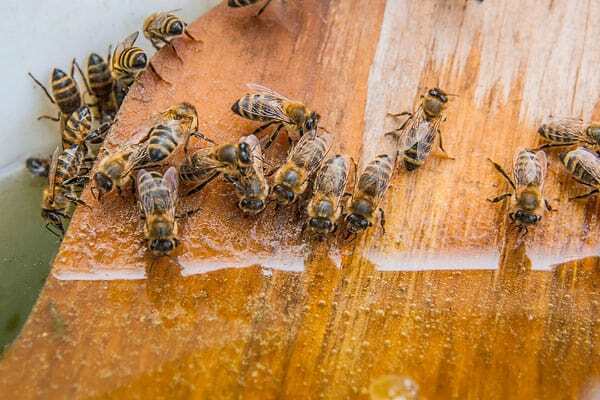 If you live in Las Vegas and are experiencing an influx of bee infestations, then it’s time to call in the bee removal specialists at Flatliners Pest Control. We will quickly eliminate any swarms before they become hostile, and can also provide safe and effective solutions for honeybee extraction. No matter what type of bee problem you are faced with, the knowledgeable technicians at Flatliners Pest Control can handle it. We can help identify the species of bee or hornet and safely remove colonies and honeybee swarms without harming the hive. Throughout the pest control and bee removal process, we take the necessary steps to protect the world around us. Our pest management team will ensure that the entire hive including the comb is carefully relocated to a local beekeeper. This allows them to keep producing honey, and continue the very important pollination process. All of our products used to prevent, exterminate, and eliminate pests are environmentally safe. This way your pets, children, and grass are not affected. So when you need bee removal in Las Vegas, call the exterminator experts at Flatliners Pest Control. There really is a science to the old myth that bees can detect our emotions and fear using their sensory receptors. The best thing to do if you are unsure of whether the species is dangerous is to call our experienced pest control technicians. We can come to your location and identify the type of bee, how big the swarm or infestation is, and create a plan of action for removal. We will also make sure to assess any possible and occurring structural damage that can occur if action isn’t taken immediately. At Flatliners Pest Control in Las Vegas and the surrounding areas, we take pride in our safe and efficient bee pest control options. We believe in taking care of the environment, eliminating the pest problem, and doing everything possible to satisfy our customers. You don’t have to sign any long-term service agreements. No contracts, just results. If you see any bees, wasps, hornets, or even yellow jackets on your property, call us today. so that you can enjoy the outdoors in and around your home or business. For most infestations - view our plans and pricing. *Scorpions, termites, wasps, bees, rodents, and pigeons require an on-site quote.